"Frights, Camera, Action!" Monster High dolls--A Joint Review! Frights, Camera, Action! Clawdia Wolf. When my lovely 23.6" Las Reinas de Paola doll, Marta, arrived from Spain last March, she actually had a small traveling companion. Making the intercontinental journey with Marta was "Amor," my favorite doll from Paola Reina's 15.7" Soy Tu play doll collection. I have been eagerly anticipating next week's release of the new Disney live-action movie, Maleficent. First of all, Maleficent is brilliantly named, and perhaps the best Disney villain of all time. I mean, she turns into a dragon at the end of Sleeping Beauty, which is pretty hard to beat for diabolical awesomeness. Second, the trailer looks great and I love the idea of a fairy tale being told from a different, darker perspective. I expect something similar to Wicked, the book-turned-musical that tells the story of The Wizard of Oz from the Wicked Witch's point of view. Unlike Legends of Oz: Dorothy's Return, this movie seems to be geared towards older children and adults. It has a PG rating, but seems darker than most Disney movies. Angelina Jolie's creepy-eyed portrayal of Maleficent might be too much for young viewers--her chilling laugh and eery smile are enough to make me jumpy. The dolls for this movie also seem to be designed for an older crowd, too, which offers a nice contrast to my last review. Both the Disney Store and Jakks Pacific have recently released 12" dolls based on characters from the Maleficent movie. The Disney Store currently only has Aurora and Maleficent ($34.95 each). Jakks Pacific has basic Aurora and Maleficent ($19.99 each), Coronation Aurora and Maleficent ($39.99 each), and also a Diaval figure that is available in a two-doll set with Coronation Maleficent. 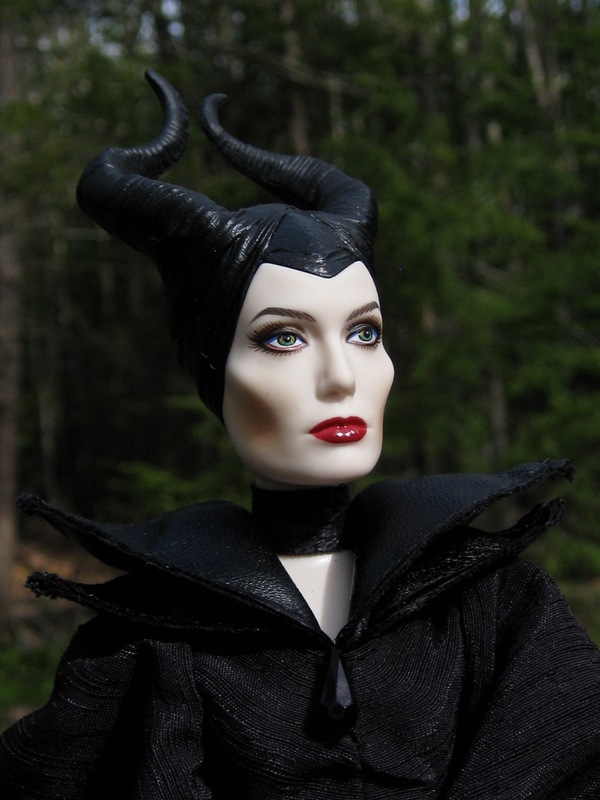 In this review, I will contrast the Jakks Pacific basic Maleficent with the Disney Store's version. The Disney's Store's new 12" Maleficent ($34.95). Dorothy & Toto from "Legends of Oz: Dorothy's Return"
The animated movie, Legends of Oz: Dorothy's Return premiered on May 9th and is getting perplexingly polarized reviews--people either love it or hate it. I watched the trailer, but probably won't see this movie myself since it seems to be intended for a pretty young crowd. I do have a general fondness for the original Wizard of Oz movie, though, based on our family's tradition of watching this classic every year when it aired on television. I always forgot from year to year that the movie starts in black and white and then bursts into color once Dorothy gets to Oz. For some reason, that effect was perpetually magical to me. Anyway--because of this fondness, I always stop to look at Wizard of Oz merchandise at the toy stores. A few weeks ago at Toys R Us, I noticed a brand new group of attractive-looking Dorothy dolls and stopped to investigate. Seeing these dolls is actually how I first learned about Legends of Oz. The new dolls are made by Bandai, and are designed to resemble the animated Dorothy from the movie. 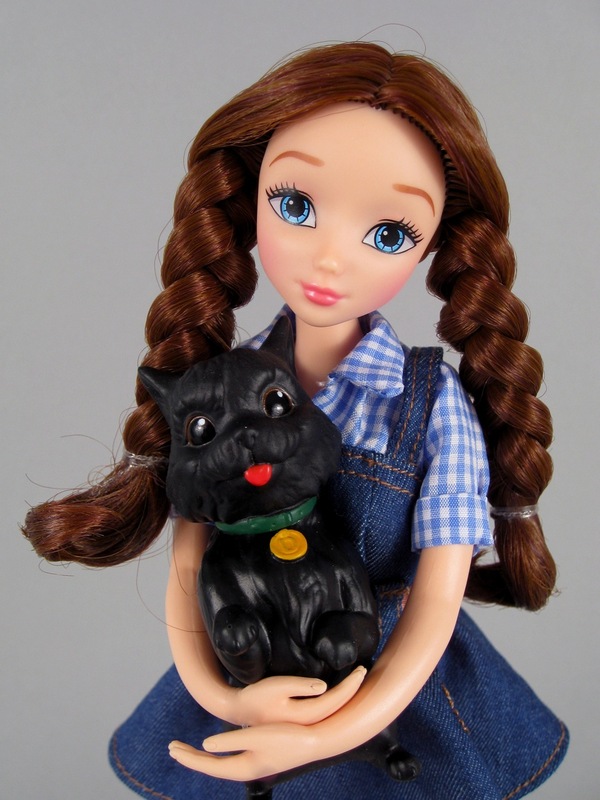 "Dorothy & Toto" by Bandai, $19.99. Best Friend Sam (£22.99) by Zapf Creation. One of the toy lines I found on my trip to Scotland is called I Love VIP Pets...which I will just call VIP Pets for short. 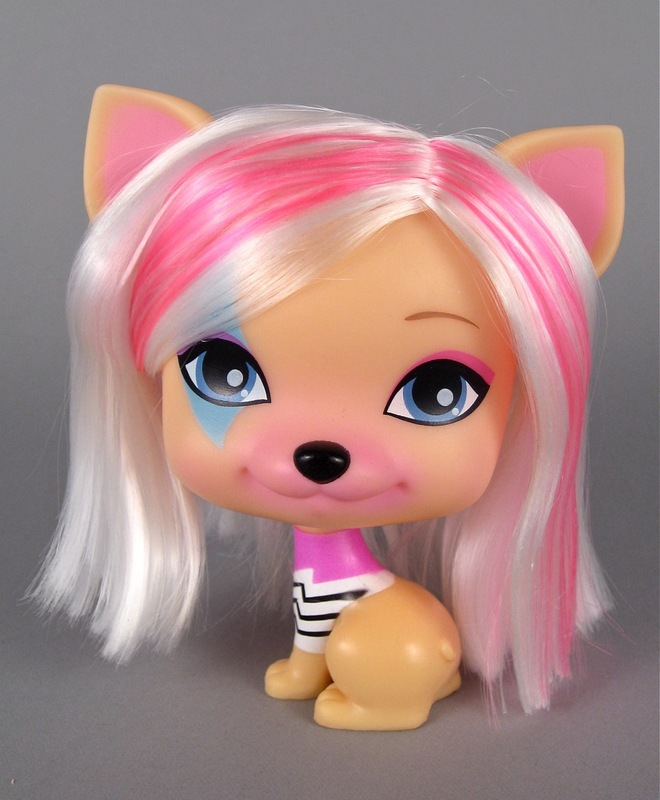 VIP Pets are 5 inch tall vinyl dog figures with oversized heads and colorful rooted hair. They are made by the Spanish-owned IMC Toys company, which also seems to hold licenses for several popular toy themes including Disney Princesses and Monster High. These dog figures appealed to me not just because I had never seen them before, but also because I like the idea of fashion toys for animal lovers. I am quite fond of Pinkie Cooper, the fashion doll with a dog's head, and am saddened that she doesn't seem to be selling very well--at least in my part of the world. VIP Pet, "Gwen," by IMC Toys (£9.99). Monster High Ghouls Alive Dolls--A Joint Review! I have been wanting to review a Ghouls Alive Monster High doll for quite a long time. When the first wave of these dolls came out, I would look at them in the store and consider buying one (Clawdeen was my favorite), but it seemed like there was always a problem with the dolls in stock--dirty outfit, funny hair, banged up box, malfunctioning electronic features, things like that. Also, I found the original near-$30 price tag off-putting, and good reason to select a simpler doll. Several months ago, a reader named Eoin wrote to ask if I would be interested in a Ghouls Alive guest review, and I was very excited to have a way to finally learn more about this group of dolls. After I read what Eoin wrote about Ghouls Alive Frankie Stein, however, three things happened: I got even more curious about these dolls, the older characters went on clearance at Target, and two new Ghouls Alive characters were released! This prompted me to finally purchase a few of the dolls myself. So...Eoin and I will show you several of the Ghouls Alive Monster High crew. Eoin will review Frankie, and I will take a look at Toralei and Deuce. I'll also throw in a quick look at Clawdeen, since she was my early favorite. 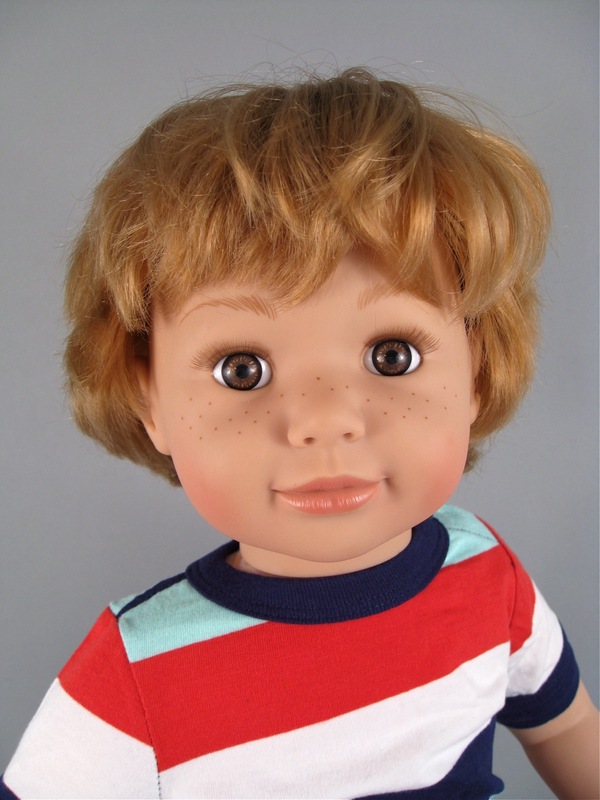 To begin, I want to turn things over to Eoin--a wonderful doll enthusiast from Great Britain, and perhaps the most patient person on the planet. Thank you Eoin, for your help and inspiration with this post! It would never have happened without you. 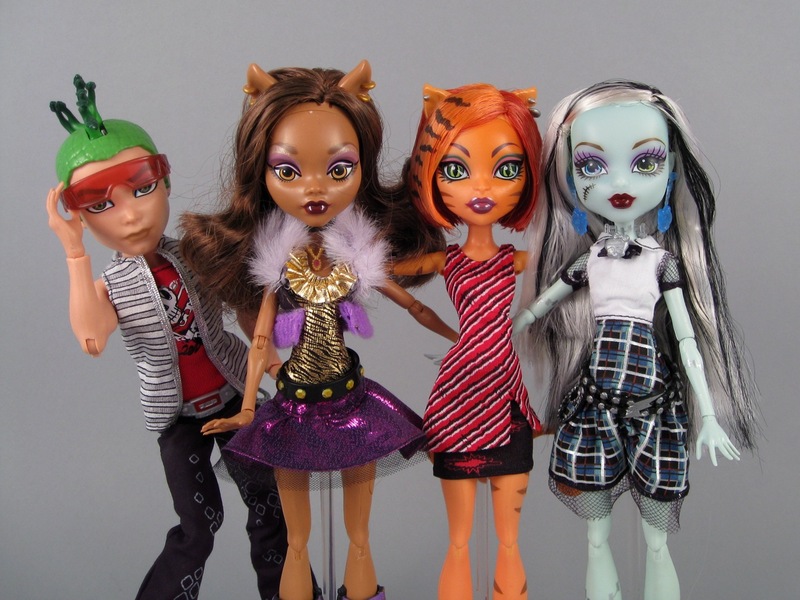 Ghouls Alive Deuce Gorgon, Clawdeen Wolf, Toralei Stripe and Frankie Stein.